A picture book that raises questions about ‘fitting in’, and the way we support or ignore people who join us. KEY QUESTION: How can we support and include newcomers? 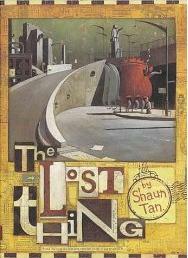 The Lost Thing by Shaun Tan tells a story about a creature who is lost, and befriended and helped by the narrator of the story. It is a useful book for exploring ideas around fitting in and not fitting in. It encourages thinking about how we cope with not fitting in, as well as how we can be friends to someone who is not being included. 1. Ask learners to write their own story of a lost thing, based on one of the images that you show them. This would be before you read the story to the group.2. Share the statement below with learners, and see how much they agree with it. You could use Fist to Five (see box right) for this to allow everyone to participate. 3. Discuss the question: why isn’t there an ending, let alone a happy ending, to The Lost Thing? This activity and book can be linked with the activities based on The Silence Seeker. Fist to five is a silent way for everyone to show their opinion about a statement or issue. Using the range from a clenched fist to all five fingers spread wide you can show how much you disagree or agree with something, and it allows everyone to participate, even the shy, and takes less time than a discussion. Make sure that learners do it based on what they think, without being influenced by their peers. Then volunteers can explain their point of view, or the teacher could nominate individuals, as they’ve had the chance to think about their view already.